Thanksgiving is just one day away and we have some great last minute gift iDDeas to keep your family and friends running this Thanksgiving. 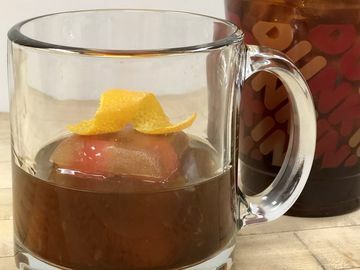 Whether it’s a Thanksgiving themed mGift, Dunkin’ Pumpkin packaged coffee or a delicious Thanksgiving recipe, we’re here to share all the details with you so you can give the gift of Dunkin’ this Thanksgiving. 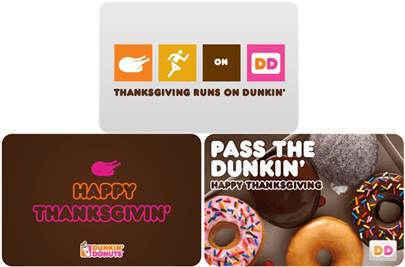 Treat your Thanksgiving host or hostess to a Dunkin’ Donuts mGift! 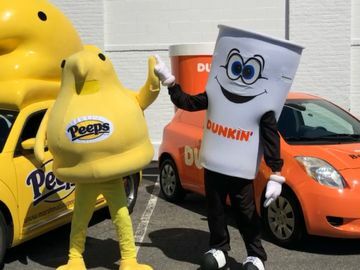 These mGifts are virtual DD cards that can be purchased through the Dunkin’ Mobile® App, which is available for both iPhone® and Android™. Simply go to the “Gift” toggle on your Dunkin’ Mobile® App and select the mGift, a monetary value and the delivery method – text, email or Facebook. You can even add a personalized message to make your mGift special. Bring the gift of Dunkin’ Pumpkin packaged coffee (8 oz.) to your Thanksgiving gathering this year! Brew at home Dunkin’ Donuts’ unique blend of 100% Arabica beans with the taste and aroma of pumpkin, nutmeg and cinnamon. 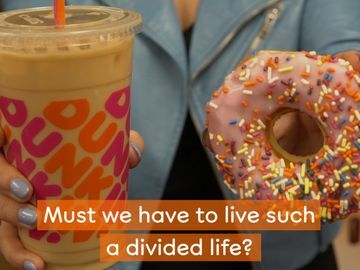 Dunkin’ Pumpkin packaged coffee is available at participating U.S. Dunkin’ Donuts restaurants while supplies last and online. 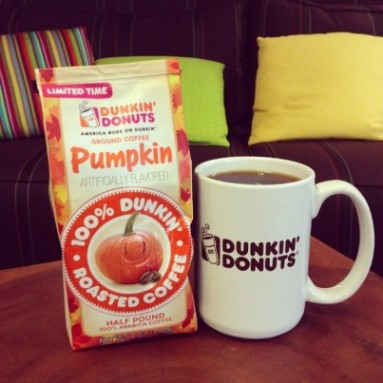 Dunkin’ Pumpkin packaged coffee is currently available online for a price of $5.99, along with a special shipping offer through December 31, 2013 for free shipping using coupon code PUMPKIN13. 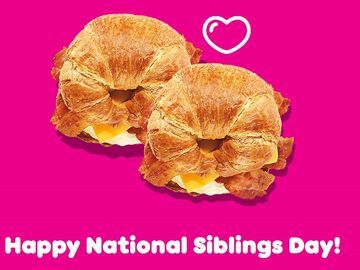 Surprise your family and friends this year by cooking up a DDelicious dish using a Dunkin’ Donuts product! To celebrate Thanksgiving this year, we created a three-part recipe series for your entire Thanksgiving dinner. 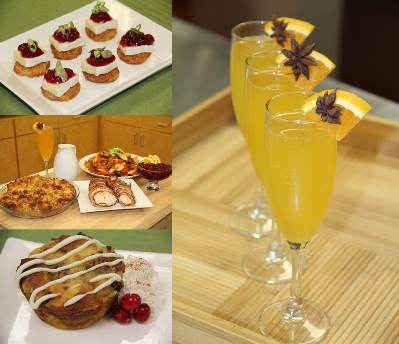 In Part 1, we introduced our Spiced Orange Spritzer and Cranberry Brie Hash Brown Canapés for an appetizer. In Part 2, we presented recipes for a complete Thanksgiving main course including Coffee Rubbed Roasted Turkey Tenderloin, Pumpkin Coffee Gravy, Roasted Root Vegetables with Pumpkin Coffee Glaze and Corn Muffin Stuffin’. 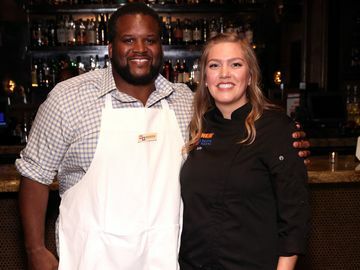 In the finale of our Thanksgiving recipes series, we created two desserts including Old Fashioned Donut Bread Pudding Muffins and Coffee Cake Muffin Ice Cream Napoleon. Share your Thanksgiving plans with us on Facebook and Twitter!